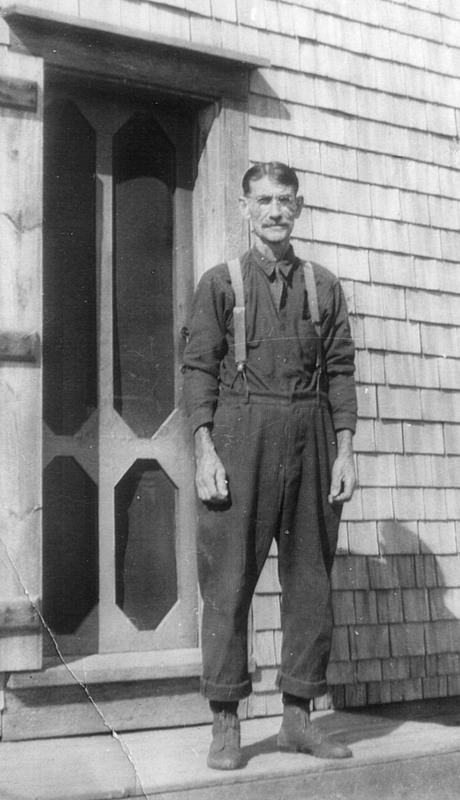 · John P. Riley was born on February 28, 1880 in Bear River East, NS, the second son and fourth child of Timothy W Riley Jr. and Mary Jane Cress. He was listed in the 1881, the 1891, and the 1901 censes for Annapolis County with the Timothy Riley family. We are not aware for what the initial P might stand (Patrick perhaps? ); it was extracted from a record dealing with the purchase of the John Riley property in Virginia East. · The 1901 census indicates that he was of the Methodist faith (although by 1911 the family appears to have moved to the Baptist persuasion), as were his mother and siblings (his father was Roman Catholic), that his occupation, like his father, was that of shoemaker, that he was working on his own in that occupation, and that in the previous year his earnings in the occupation had fetched $151.00. The earnings contrast with those of his father who reported income of $200.00 for the same period. · John was in that year the oldest child at home, older brother George having left a few years earlier, and sisters Margaret and Lottie having recently taken up domestic servant’s positions in Boston. · Interestingly the 1901 census lists the family together as a single unit. However, Mary Jane testified in court in November of 1901 that she had moved from the household in February of that year, and had made an agreement with Emerson Long, whose house she was looking after, that children John, Viva, and Boyd would be permitted to stay there as well. The 1901 census was to be taken 30 days either side of Census Day which was proclaimed as March 31, 1901. Either Mary Jane’s testimony was slightly off on its February date, or Corey Long the census taker, who knew Timothy well, simply put the family together in his report. We are not certain just where Jennie and Bill were later in 1901 at the time of Mary Jane’s testimony. · John Riley married Alice Trimper on May 24, 1905 in the Clementsvale Baptist Church with Rev. J. H. Balcom officiating. Witnesses were the good Reverend’s wife and Leota Trimper, the bride’s youngest sibling. The marriage record notes John to have been a 25 year old bachelor farmer, and Alice as a 25 year old spinster. · Martha Alice Trimper was the daughter of John's first cousins John E Trimper and Emma E Beeler, the fifth of eight children and the third of five girls. She was born on August 4, 1880, in Clementsvale, NS. In 1881 she was listed as a one year old with German roots (great, great-granddaughter of Hessian soldier Henry Trimper who was mustered out in the Bear River area in 1784) living in the Clementsvale area and her name was given as Martha Alice. In 1891 she was listed as an 11 year old living with her parents and five of her seven other siblings in Clementsvale; her religion was stated as Baptist similar to that of her mother. In 1901 she was listed in the census as a 21 year old living with farmer brothers David E. and Ivan C. Trimper in Clementsvale. Interestingly, her eldest son Roy was not listed in the 1901 census suggesting his birth was later than the March 31 day of record for the census. · John was listed in McAlpine’s 1907-1908 Directory for Nova Scotia, along with a second John Riley with a Clementsvale address; the two John’s were listed respectively as a farmer and a labourer, but it is not possible from this record to ascribe one or the other specific occupations to our John. · By June 11, 1911, at the time of the next census the John Riley family appeared to be living in Virginia East and had expanded to six, with additions Lee Etta (Apr 1906), Walton (Nov 1907), Esther (Jan 1909) and William (DuVernet) (Jan 1911) present. Over the next ten years the couple added Ora (Mar 1912), Alban (Sep 1913), Dennis (Jul 1915), Douglas (May 1917), Vera (Apr 1919), and Edmund (May 1921). Vera was the last living of the offspring, passing away in Summerside, PEI in November of 2002. · John appears from the record to have bought the family home in Virginia East in 1915, purchasing it from John B. Coombs who apparently originally held the land. The house appears to have been built by John B’s brother Enos Coombs in 1874 or thereabouts. McAlpine’s 1907-1908 Directory provides John Riley with a Clementsvale address; by June of 1911 the family was living in Virginia East, likely in the same house via a rent contract because John B. Coombs had repurchased the property in 1902. · According to son Alban the family grew up very poor, essentially a subsistence existence, eking a living off the land to as great a degree as possible. The family kept a cow, a few chickens, and a pig or two for butchering in the fall, and maintained a garden. One available photo taken in 1943 shows an extensive potato garden. Alban relates to teaming the family-raised oxen in the early 1920’s before his teen years. Their main meat staple appears to have been venison and Alban tells the story of shooting his first deer one night after school at 10 years of age as the larder was bare and the older boys were otherwise occupied. He noted that a deer would last the growing family in the 20’s somewhat less than a week. · Two other incidents that arise in respect to the poverty in which the John Riley family lived had to do with cousin Jennie (Riley) Fahie giving Vera one of her coats at one point in their childhood when the kids wanted to go someplace in the winter and Vera would have been unable due to lack of appropriate outerwear. A second has to do with the fact that during one winter the boys apparently had to take turns going out to play because they shared one pair of winter boots – apparently John’s brother Bill discovered the situation and acquired boots for the kids. · Various sources point out that John Riley was a very strict disciplinarian particularly with his boys, and tended to be gruff and cranky and distant except when he had been drinking; he then opened up and became quite expansive. He also appears to have been something of a fuss budget because the grandchildren were instructed that in trips to the barn or the garden they must confine their steps to the existing rutted paths. · He has been described as “not kind” from the eyes of a child and children were not usually allowed to talk around him. Grandson Ted Coombs who lived only a few doors down the road remembers only one occasion being alone with his grandfather when they walked down to the back field to retrieve an axe. Ray Riley has vivid memories of some of the weekend outings to Virginia East in the late 40’s including some of the visits to Ora’s and Vernie's (DuVernet) homes, fishing trips, and playing with his cousins. However, there are no memories in that mental album of ever having interfaced with his grandfather. While it could be some sort of a regressive memory at play here, the more likely scenario is that the meetings never occurred. · John also is reported to have told his 18 year old unmarried daughter Vera not to return home with her firstborn. It is easy to speculate that John’s attitude in this instance well may have been generated from his own inability to handle the presence of Alice’s son by another man when she came to the marriage (see below). · In stature John was tall and his distinguishing feature (at least in his later years) was his white waxed moustache which he often twirled with his fingers. He also is reported to have slicked his hair down with lard. · Procrastination appears to have been one of his common traits and there are stories of Alice trying to get wood to burn in the winter when it was still green as it had not been cut early enough to dry; also of the boys having to haul wood up from the back pasture on sleds over the winter snow because it had not been hauled and put under cover in the fall. · He apparently had no housekeeping or cooking abilities; one pundit put it that he “could not boil water” and after Alice died in 1944 the kids had to either look after him or find someone to so do. He had a reputation as a bit of an amorous terror with his housekeepers after Alice died and they tended not to stay long. Nellie Spurr was apparently one of his last housekeepers. · He spent his final few months in 1952 and early 1953 just down the road at DuVernet’s house under the watchful care of daughter-in-law Ethel. · Marion (Riley) Mullen remembers Alice as a busy little woman whom she accidentally locked in the outhouse one day and, not wanting the dressing down she was expecting to get for the deed, left without opening the door; she believes her Dad eventually let Alice out. · Interestingly, Alice entered the marriage with a 4 year old son Roy, whose father was said to be a John Curtis; however, Roy is not present within the family circle in 1911. According to Keith Trimper, John Riley wanted nothing to do with Roy and by at least 1910, if not before, he had been shuffled off to live with his bachelor great uncle Ernest Trimper and uncle Ivan (although he was not listed with Ernest in the 1911 census; his whereabouts in 1911 awaits further work on the census). Roy was reported to have left for Boston in 1916(?) at 15 years of age with three other local youth; he does not appear to be listed in the 1920 US census. The 1930 census indicates that Roy finally immigrated to MA in 1921, married in 1925, and made his home and raised a family there. He is reported to have died in 1951. · Roy married Margaret ??? in 1925 in MA; Margaret had immigrated from Canada in 1923, reportedly from Cape Breton. The couple had three children: Ernest born Nov 1925, Margaret born in Jan 1928, and Robert born post-May 1930. · Alice Riley died on May 25, 1944. Apparently John considerably upset daughter Esther at that time by destroying a cake that Esther had made to celebrate her mother’s birthday which was the day before Alice died. John also apparently burned a deed to some property immediately after Alice died. · Alice and John are buried in the Clementsvale cemetery. · Much of Alice’s personality and the warm relationship with her family can be interpreted from the following letter which she sent to son Alban in 1944 when he was with the RCAF in Europe. The letter is postmarked Clementsvale, March 14, 1944 and was written slightly more than 2 months before Alice died. The material has been edited for only spelling and punctuation, and paragraphed to aid in clarity. I will try and cable you a few lines telling you that I got the three pictures you sent to me. They were real nice. We all think you look so well Alban and I hope you do keep well. Thanks for the pictures, Alban. I sent one to Lee Etta, gave one to Walton and Ede. Well, Vera came home for the week end, came Saturday afternoon and went back Monday. I suppose you have gotten my letter before this time so you will know where Vera has gone; she likes it fine up in Sussex – she was well and getting along all right up there she said, so I am glad that she likes it there Alban. Vera put your picture in a nice frame Sunday so I have it sitting on the room mantle shelf. I think a lot of you boy’s pictures and me I often wish you boys could be back home with us again. I had a letter from Edmund Saturday, March 4th. He was In Newfoundland when he wrote my letter Feb. 28th and Edith got a letter from him last Saturday. He wrote her 28th Feb. so I hope to get a letter from him again this Saturday, Edmund hasn’t been to Iceland yet but he thinks they will soon be going, me I hope not as I wish he was coming closer to home. But DuVernet thinks they will be in Iceland for a while and then go from there overseas, but I hope not where you are Alban Dear as enough of my boys to be there but I suppose I will have to try and keep up and think on the bright side and hope to see better days ahead. But I can’t seem to think that. I just seem to think what have I got to live for, you children have all gone from home, and I am not well at all, and we have to keep a hired girl, so that no pleasure for me. But if I was well so I could do my own work and could feel like going out around and enjoying myself but I don’t feel like doing. But maybe I will be feeling better when summer comes. I hope so anyway. Well Alban, I had a letter from Esther Dear yesterday, and she not very well. Well Alban Dear this is Monday March 13th. I started to write this letter the 8th. Ora came in and told me that her boy Lloyd was looking for Easter cards in the mail on the 9th so I thought I would wait and get a card and send you so I will write you a few more lines and send this letter along with the card. I am sending Roscoe Dear a card, the dear boy. I hope he’s getting along all right. I had a letter from Lee Etta Saturday. She said she had a letter from Roscoe. Roscoe said he would rather be in Canada than to be over there, so Lee Etta said she knew that Roscoe didn’t like it over there. It’s too bad that the boys have to go where they don’t want to go. Lee Etta got your photo I sent to her; she thinks it looks just like you she said, and was so pleased to get it. I sent her one of Edmund and Edith taken together and I am sending you one of them. They were taken the Saturday after they were married Feb.2nd, 1943, standing but here by the corner of our house. Well Alban, I guess Edmund has gone to Iceland. Borden Sanford, Norm’s boy, wrote home to his mother that Edmund had gone overseas, as Borden was stationed to Newfoundland, and a lot of other boys that Edmund knew were there. Edith or I didn’t get any letter from Edmund last week so we think he has gone to Iceland. He told us here the night he went away, Dec. 29th, that he would try and send a cable to us as soon as he got there if he could, so we are looking for a cable or a letter soon. My I do hope he will and they’re all safe. Alban, you don’t know how bad I do feel to have Edmund and you so far away from home, but then I have to stop and think, my boys are not the only boys that had to go. But Edmund was always home here with us and we do need him with us the same now as his Dad has to go to the woods alone. He was back this forenoon and chopped firewood. This afternoon he took the steers and sled and went back and hauled but 2 loads of firewood, so that way he works along. I think he got some cord wood started out and sold it to Harry Harris. Walton Is still chopping for Burens E.L.C. DuVernet Is chopping for himself I think. Well Alban, I want to go down to Bear River some time when the roads get good, and I plan to see Dora and Ray and her children. They say Ray is awful smart. I would like to have a picture of Dora, Ray, and the other children. Well Alban, it has been dull here today and has thawed quite a lot. It has settled the snow quite a lot today. Your Dad said that it had softened the snow in the woods. Well Alban, I guess I have told you all for this time so I hope this finds you well. The sick around here are all better so this leaves us all quite well at present. Oh Alban, I had a letter from Dennis Thursday. He said he would be coming home the 15th; that will be the day after tomorrow. Esther wrote me that she was sending you a box. I hope you get It. Write soon, Alban. My pen don’t write good at all. Love from all at home and your loving Mother. · The above can be interpreted to frame Alice as a loving mother, most interested in the welfare of and contact with her children, and most concerned with the whole war effort and the fact it put her boys, plus other young men, in jeopardy. She had to have been an expansive lady with the ability to rise above her own tribulations and express empathy for those around her. Other than the fact that she says she is not well, there is little hint that she had only a few weeks to live, and this is corroborated by her obituary which notes that her death was sudden and a shock to the family. The letter obviously meant something to son Alban, not known to have much of a sentimental streak, for it to have been brought back from Holland and to have survived an additional 45 years in his care. 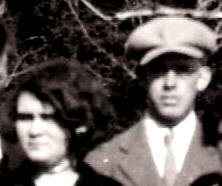 o Lee Etta Mae married Harold Mansfield in June of 1923 in Caledonia, NS. The couple had four children Roscoe (Nov 1923), Alma (Sep 1926), Esther (Dec 1931) and William (Jan 1936). Harold, who practiced carpentry and worked in the woods as well, died in 1951. In late 1952 Lee Etta married Wynn Hull, acquiring five step children in the process – Beulah, John, Wilfred, Lindsay, and Alvin Hull. Wynn died in September 1959, and Lee Etta in May of 1993, having spent the greater part of her life as a homemaker in the Caledonia/New Germany area of central Nova Scotia. Lee Etta is buried in Westfield, NS. o Son Walton Cleveland married Clara Edith “Ede” Milner in March of 1930 in New Germany. The couple had no children. Walton, generally a quiet man with a bit of a twinkle in his eye, spent most of his working life working in the woods. He died of cancer in October of 1950 at the early age of 43 and is buried in the Clementsvale cemetery. Ede, who never remarried, had an illustriously long lifeline and passed away at 96 years of age in March 2001 in the hospital in Annapolis Royal, NS. She lies in the Clementsvale cemetery next to Walton. o Esther Jane married Laurie Thompson in August of 1931 in Bear River, NS. Esther tended to have a positive outlook and carried most of her younger siblings’ ‘love of the spoken word’. The couple had five children: Dorothy (Aug 1931), Gerald “Bud” (Nov 1934), Marlene (Apr 1936), Patricia “Pat” (June 1938), and Dale (March 1947). Laurie spent much of his career working in Nova Scotia and New Brunswick as an equipment operator for the Lincoln Pulp Company of Lincoln, ME. He died in Digby, NS, in 1962. Esther, who had spent most of her married life raising her family in Bear River (although she had worked for Doctor Lovett for some short period of time), moved to Kentville, NS, shortly after Laurie died and was making her home in that community when she passed away in the Camp Hill hospital in Halifax in 1981. Esther is buried in the Mount Hope Cemetery in Bear River. o DuVernet William or “Vernie” married Grace “Ethel” Milner, the younger sister of Walton’s wife Ede, in Bear River on June 15, 1932. Vernie and Ethel had seven children: Lewis (July 1932), Marion “Bob” (Apr 1934), Doris (Oct 1938), Wilfred “Wif” (Mar 1943), Royce (Aug 1950), Neil (Oct 1956), and Sharon (April 1958). Vernie, who tended to be a generally quiet and gentle man, worked in the carpentry business for most of his adult life and was reputed as one of the better finishing carpenters in the area; Ethel worked as a homemaker. Vernie passed away in Halifax in July of 1982 and is buried in Clementsvale; Ethel passed away in the Annapolis Community Health Centre in 2004 and is buried adjacent to Vernie in the Clementsvale cemetery. o Ora Isabelle married Andrew “Joe” Coombs in April of 1930 in Caledonia, NS. The couple had three children Lloyd (May 1932), Ted (June 1934) and Arnold “Sonny” (Sep 1936). Ora, who was known as perhaps the most direct of the Riley children in her dealings with others, tending to ‘call a spade a spade’, spent most of her adult life in Virginia East, although in the early years the couple lived in Clementsvale. Joe worked most of his life in the woods or in sawmilling. 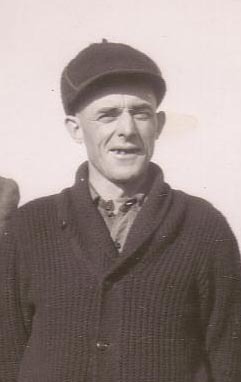 Joe died in Digby in 1963 and is buried in Clementsvale cemetery. For the most part Ora worked in the home, although she did undertake seasonal work picking apples in the Annapolis Valley. 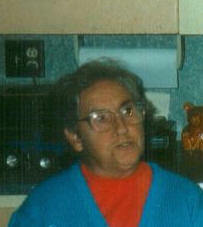 She passed away in Middleton, NS in 1998 and is buried next to Joe in the Clementsvale cemetery. Alban Ernest married a Bear River girl Seretha “Dora” (Rice) Krant in August of 1941 in Quebec City where he was in basic training with the RCAF; he was then shipped overseas and spent most of the war in England and later Holland. Dora had been previously married and had three US-born children Shirley, Clyde, and Thelma. The couple’s first and only child, Ray, was born in Digby, NS in Jan 1942. After the war Alban opened a small watch and clock repair shop in Bear River, at which profession he remained until he retired in the mid-1960s; for the most part Dora spent her time as a homemaker, although she was an accomplished seamstress and did undertake contract sewing projects. Alban had the reputation of one of the area’s best storytellers, entertaining kids for hours, and was locally known as “Gabby”. Alban died in Middleton in Aug 1990 and Dora in a nursing home in Bridgetown in Oct 1994. The couple is buried in Mount Hope Cemetery in Bear River. 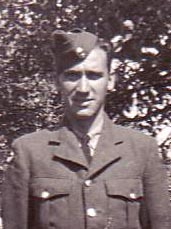 o Dennis Ellsworth, the tallest and perhaps the leanest of the siblings, followed brother Alban’s footsteps into the service and joined the Canadian Army during WWII and saw overseas duty (?). He also tended to follow his older brother’s footsteps in his love of the spoken word. In June 1946 Dennis married Geneva Murray of Chipman, NB. The couple initially took up residence in Bear River, where their children were born and raised, later moving to nearby Deep Brook, NS closer to CFB Cornwallis where both Dennis and Geneva worked, Dennis as a Commissionaire and Geneva in a civilian capacity. 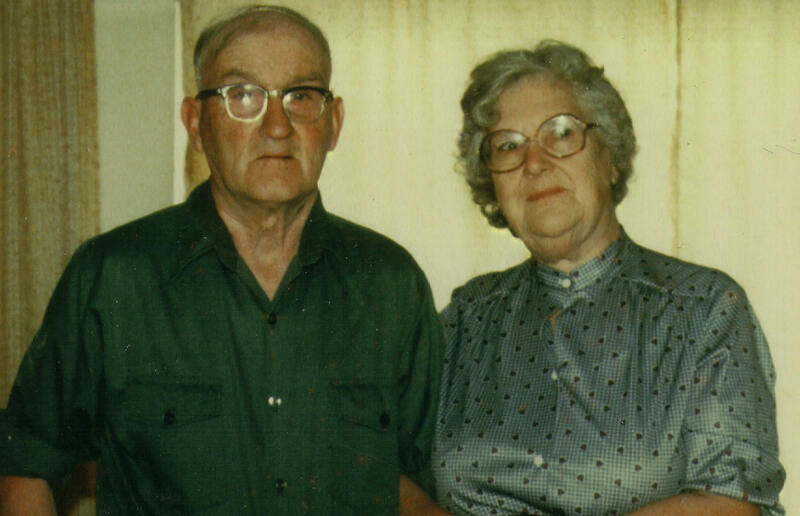 While resident in Bear River Dennis and Geneva had two children, Nancy (Mar 1947) and Terry (Dec 1952). Dennis passed away in Digby NS in Oct 1982 and is interred in the Mount Hope Cemetery in Bear River; Geneva passed away at home in May 2008, the last of the John P Riley family of that generation. 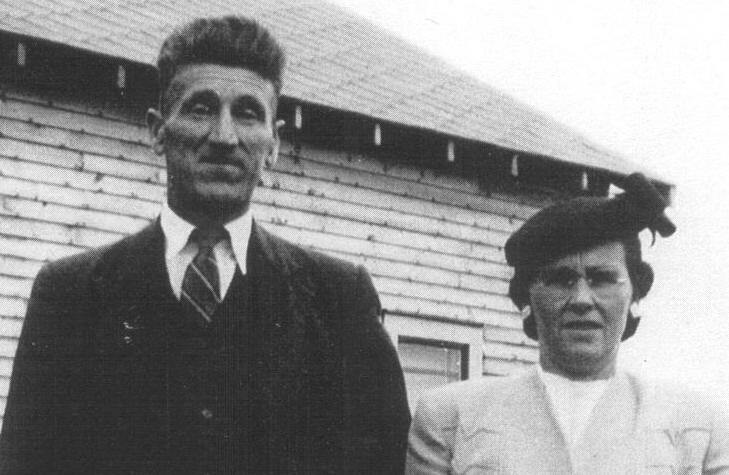 o Douglas Densmore married Iylah Barteaux of Clementsport, NS c. 1939. He likewise joined the RCAF during WWII, apparently spending most of his military career in Halifax. He and wife Iylah had two children, Douglas (born and died Nov 1939) and Patricia (Mar 1940). Iylah died in Sept 1943 after a lengthy illness and is buried in the Clementsport cemetery with her parents. 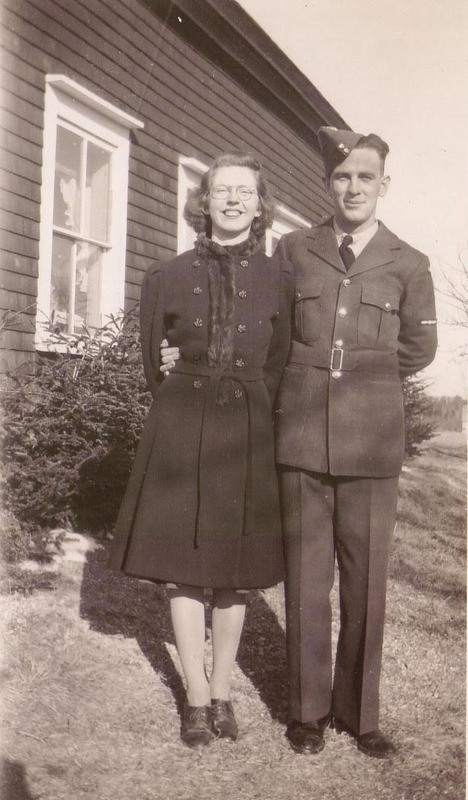 In Jan 1945 Douglas married Vera Steeves, a military compatriot from Moncton, NB. After the war the couple took up residence in the Moncton area, moved to the Virginia East, NS area for a couple years in the early 1950’s and then back to Moncton. The couple had seven children, three of which including Susan and Joyce died in infancy: Susan (Aug 1945), Charlotte (Nov 1946), Noreen (Feb 1948), John (Feb 1949), Infant Riley (c 1952), Brenda (Oct 1953) and Joyce (July 1955). Doug separated from the family in the mid-1950s. Vera continued to live in the Moncton area and passed away there in Nov 1986. On leaving the family Doug made his way to Saint John and entered another relationship; the couple had one daughter Susan (Jun 1963) in Saint John, and another daughter Shani (Dec 1968) and a son Shawn (Aug 1970) in Toronto. The couple appears to have separated in Toronto c 1971; Douglas died in Toronto in March 1974 and is buried in Toronto’s Mount Pleasant cemetery. o Vera Marie’s first child, Lionel, born in February 1938, was not well received by her father John. As a result the infant was fostered-out to Roy and Cora Taylor who eventually adopted him. Because of the continued tension at home Vera, in due course, moved in early 1944, with the assistance of brother-in-law Laurie Thompson, to Sussex, New Brunswick where she took up employment. She eventually moved on to Saint John to increase her employment opportunities. In Saint John she boarded with the Prime family whose son Allison (Al) was still away in the service. After the war when Al returned home it was not too long before romance was in the air. The couple was married in Sussex, NB in 1948. They had two children - Roger (Apr 1951) and Carolyn (Feb 1956). Al passed away in March of 1990 in Moncton, NB; Vera died in a nursing home in Summerside, PEI in Nov 2002. Both were interred in Fairhaven Memorial Gardens in Moncton, NB. o Edmund Willard followed the footsteps of his older brothers in both joining the RCAF c 1942 and in being well able to carry his end of a conversation, although he may have exercised a better balance in talking and listening than did some of his older siblings. 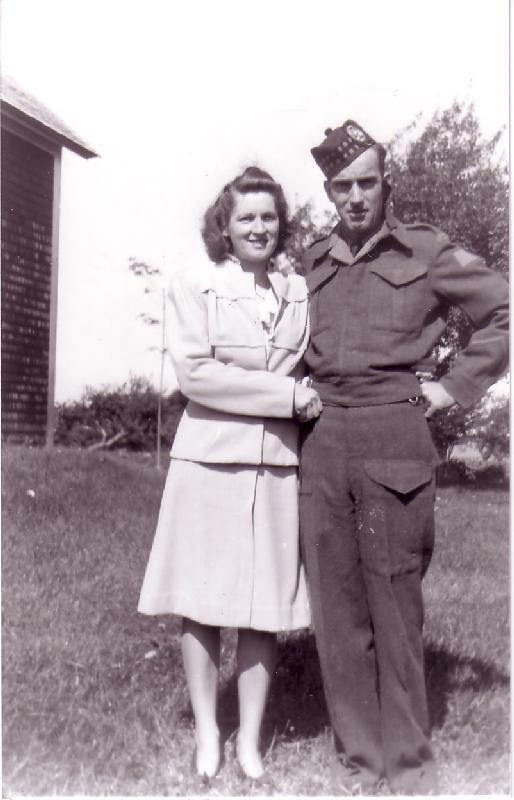 In Feb 1943 he married Edith Dondale in Clementsvale, NS. On Ed’s return from overseas the couple had two children Gerald (July 1947) and Bruce (June 1953). In civilian life Ed worked as a transport driver at CFB Cornwallis; Edith was a teacher by occupation. 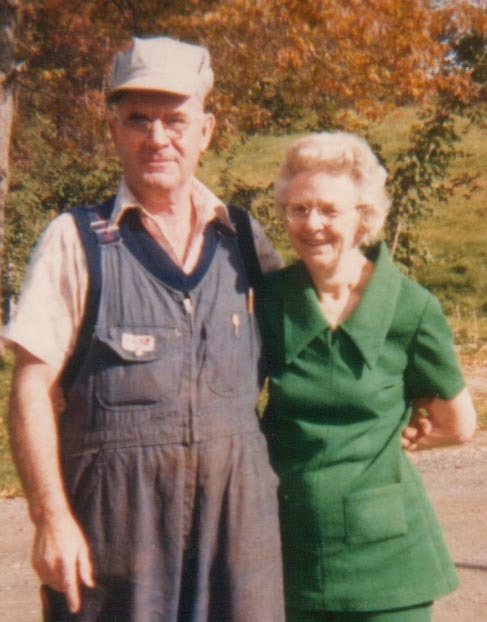 Separated in their later years, Ed died in May of 1977, and Edith in April of 1992. They are both buried in the Clementsvale cemetery. · An interesting retrospective observation is that the Riley children did not maintain close family ties. From Ray’s perspective this was particularly evident after Walton died in 1950 when previous occasional family weekend visits to Virginia East terminated altogether. Alban, Denis, and Esther, being in Bear River, had subsequent occasional informal contact as did family members, and it is assumed the same is true of the Virginia East-based siblings. During the 1950’s Vernie and Ed occasionally dropped into Alban’s watch repair shop to pass the time of day when other business would take them into Bear River. Ray has no recollection of ever meeting Lee Etta, a vague memory of meeting Douglas once in Alban’s shop in the early 1950’s, and had no recollection of meeting Vera until he visited her in Summerside, PEI in 2000.